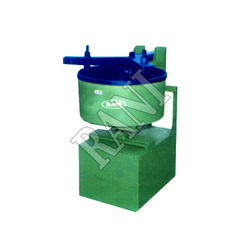 Providing you the best range of pan mixer and semi automatic brick making machine with effective & timely delivery. We have achieved paramount success in manufacturing and supplying of Pan Mixer in the market at the present scenario. It is used to manufacture tiles by pouring the slump concrete into rubber moulds. Firstly, the concrete mixer is condensed using vibro forming tables, and then, these moulds, with wet concrete, are kept over flat plate in order to gain initial strengthening. The wet tiles are further exposed to the controlled atmosphere for providing hardness to the products. Later, polyurethane or varnish coating is applied on the tiles to ensure their wear resistance, and to beautify them. We provide a solution to the variegated demand of Semi-Automatic Brick Making Machine in the market by manufacturing and supplying the same for our customers. Methodological excellence and outstanding technique behind the design of this particular product differentiates it from the rest in the marked and enables it to emerge as the prime choice of the customers. This machine is a soft mud molding machine. This machine from our side yields originally handmade designed brick and produces huge number of bricks per hour.